As much as I love technology, I must say, there are some things that I miss. 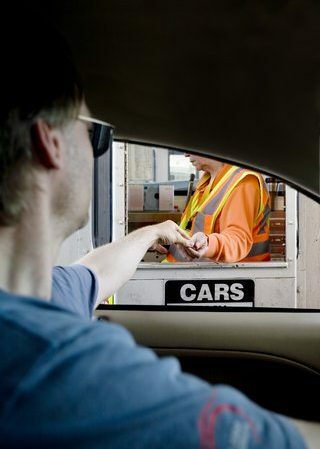 Do you remember tossing the coins in the bucket when you were about to enter a toll road. Of course, back in the day it used to be a twenty-five cents, so it was either a quarter or if I was feeling lucky, I’d go for five nickels. It was kind of fun to toss it in and hope the light turned green. As everyone knows, that quaint experience of rummaging through your ashtray to find loose change has now been replaced by your Sunpass device which is linked to your credit card. All you have to do is keep on driving and the money magically disappears from your account and winds up in the State coffers. If you don’t have a SunPass account, no worries, the State will track you down via your tag and send you a bill in the mail. All that sounds like progress. Except when . . . Your credit card expired and you forgot to alert Sunpass? Or when you moved and forgot to forward your mail. Or when your ex-boyfriend or ex-spouse decides to cancel the account without telling you. In a perfect world, having things done electronically is easier. However, it should be obvious by now, that we don’t all live in a perfect world and the reality is that people get tickets for things they aren’t even aware of. (Red Light Cameras are another one, but don’t get me started on those). Now, because we are talking about the real world, I must point out that most people don’t go through one toll or Sunpass overpass. Usually, as part of your daily routine, you keep going through the toll lane assuming everything is fine. And why wouldn’t you assume everything is fine? The State has taken away any kind of feedback to let you know everything is fine or that you have a problem. So, as I’m sure you’re now realizing, most people who get a Sunpass ticket don’t just get one, they get many. By the time you even realize what is going on, you could have dozens. It really doesn’t take that long before you are in real hot water. If you are reading this and nodding as you try to organize all the tickets you’ve just received, whatever you do, don’t run down to the courthouse and just pay them. You could be doing yourself a real disservice. I know, they don’t carry points, so what’s the big deal? You could not only be wasting thousands of dollars, but you could also be creating a huge driving record problem for yourself. That’s right, each of these tickets is well over $100. You do the math, it’s expensive. Hiring a traffic attorney who can walk into court and fight on your behalf might allow you to only have to pay a very small percentage of these tickets. Instead of paying for 25 tickets, you might only have to pay for 5 or 10. So, in addition to the legal fee, you might be able to save thousands. Don’t believe me? I do it all the time for our clients. In addition to the savings you will receive by not paying every ticket, you won’t have as many tickets on your driving record. Believe me, it doesn’t look good when your insurance company or judge tries to look at your record, and the pages keep unfolding. Lastly, you will save time and money by not having to attend the court hearing yourself. There are a few hours of your life right there. The best part is when you have multiple tickets, you qualify for a discount. That is a plan made for toll or Sunpass tickets. Do yourself a favor and take advantage of the free consultation. Just call 866-374-8355 and you’re on your way.